Two month old ducklings. The brown ones are hybrid layers, the speckled whites are Welsh Harlequins. Winters are when I really get us into trouble. The relative ease of managing the homestead leads to foolish ideas on new projects that “won’t be that much more trouble.” From such folly emerges insanity like the great barnyard poultry project of 2015. The idea was somewhat sound: see if layer ducks and turkeys could replace the functions of layer chickens and meat chickens in the orchards and on our table. Layer chickens are the gateway drug: fresh eggs can’t be beat and they dramatically reduce the pests in the orchard. But they aren’t perfect. They have relatively short laying careers, they all molt at once, and ours regularly revolt from using their nest boxes, hiding eggs that we can’t eat or sell. Knowing that we needed more birds on the ground but didn’t want to winter over more layers, we raised our first meat birds last year. I ordered Jersey Giants that turned out to be bigger birds but not all that giant. They took a while to grow to full size, but were enthusiastic foragers. This year I had the bright idea that we could raise up a batch of meat birds ready to forage just as the codling moth larvae started to emerge in the spring, and then we could harvest our year’s meat supply in one go. To make the timing work for when we could get hatchlings and get them ready to go into the orchard, we would need a faster maturing chicken. So I ordered a proprietary hybrid chicken that would supposedly be ready for table in 12 weeks. Never again. Maybe it was the altitude, maybe the hybrid strain, but some of these meat birds literally fell asleep with their beaks in the food bowl. They grew fast enough that several developed leg deformities. Only a couple made it more than 20 feet from their home in the hoophouse. I feared for their lives as it got warmer as they were too lazy to move out of the hoophouse into the shade. If we want birds to run down grasshoppers, it wouldn’t be that breed. Once we harvested them, the color of the fat and their livers did not scream out “healthy animal” like the Jerseys did with the same or better feed and care. But any meat chickens have their limitations, especially that they all mature at once, and we needed season-long coverage for the grasshoppers. Was there an alternative to a foraging heritage chicken breed or more layers? Heritage turkeys seemed like a good idea because 1) they haven’t had the foraging instinct bred out of them, 2) they might actually breed their own replacements, 3) they can be harvested over several months, rather than meat chickens, all of them threatening to go tough if not processed within a week or two, and 4) I like turkey meat. So in the depths of last winter’s dark evenings, I ordered the minimum number of turkey poults: 15 from Porter’s Rare Heritage Turkeys. 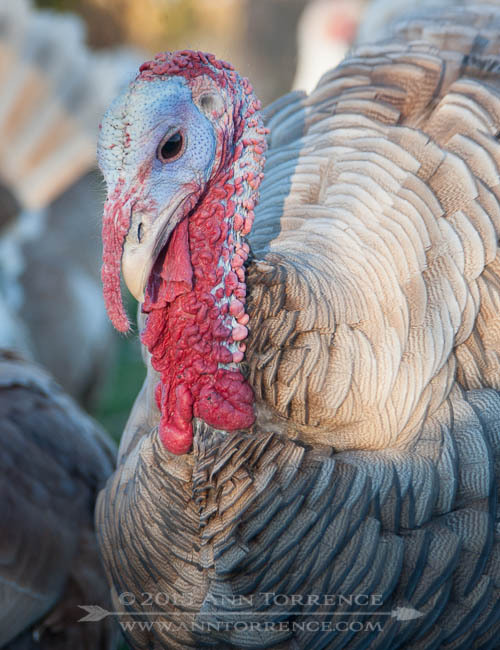 Fifteen is a lot of turkey dinners. Perhaps because turkey poults are exceptionally fragile, perhaps out of a glut of hatchlings that needed to go, or a simple act of kindness, they sent us 17 chicks. As is all too common with turkey poults, four died in the first few days for no apparent reason (we almost never lose a chicken chick, but turkey poults are legendary for falling over dead at random). After that, they were nearly bulletproof. Sturdy birds that took to foraging like champions, as their feathers came in we discovered we had an amazingly colorful flock. Then they started to grow up into displaying gobblers and hens, fearless but safe around visitors and especially small children. 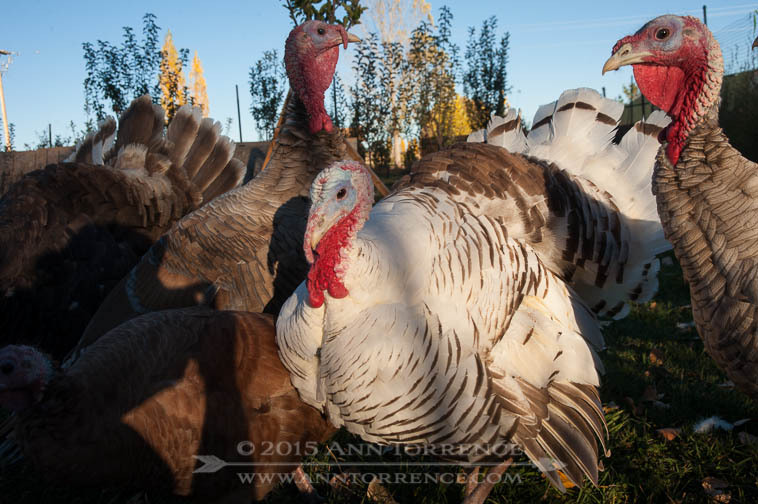 Heritage turkeys in the orchard. One of these was Thanksgiving dinner. We gave the White Chocolate palm male (center) and his consort to some friends who have a farm. That pair has found life on easy street, getting fed treats out of hand. In some respects, turkeys are not as easy as chickens. One day they absolutely refused to be cooped up anymore for their safety at night. They fly over the orchard fence if we don’t keep up with clipping their wings. They need more protein in their feed, which means we have to feed them differently than the other birds. There were times I thought once these were gone, we’d be done with turkeys and make things simpler again. Then we harvested one in October. I’ve bought all-organic turkeys from the hippie natural food stores before, and its flavor pales in comparison to this meat. The verdict: turkeys are staying. Last spring we tried goose eggs for the first time, and while our hen eggs are rich, they are nothing like goose eggs. Would duck eggs be similar? In the literature, ducks bred for egg-laying have many virtues: they lay for more years, they can lay more eggs per year than a hen, and they lay at night so they don’t hide their eggs. There’s stuff you learn by reading and then actual knowledge gained by doing things. I read the part about ducks being messy with their water, a problem we only recently thwarted by putting their waterer on a pad of gravel so they don’t excavate ankle-breaking holes in the mud. They were even putting their heads through the fence into the goat pen and messing up their water. And their manure is, shall we say, pungent compared to the rest of the fowl. They are foul fowl. But they are very happy barnyard critters. To my ear, a cranky duck sounds more cheerful than a satisfied hen. And hens are rarely satisfied. In mid-September, while the juvenile ducks were roaming around eating earwigs and swimming in their kiddie pools, the hens all molted at once. We had no more eggs to take to the farmers market. No eggs for our own table. Just an ongoing feed bill that would carry on until spring without any returns in productivity. Some of our hens are a bit “senior” and are past their egg-laying prime anyway. About then we started getting duck eggs, a pretty nice supply that should increase in the spring. So we have duck eggs. I was somewhat surprised at the farmers’ market that I couldn’t even get people to try a half dozen at a cheap price. There must be some nasty duck eggs out there that scare people off. Ours are wonderful. But if I can’t sell the excess, even if the ducks are happy, should we continue yet another layer of complexity in chores? We are still undecided. We are keeping one drake from the Welsh Harlequin group (I also ordered some hybrid layer ducks) and if any of the Harlequin females goes broody and raises a clutch, that might increase their odds of staying. We learned from the geese that letting the girls do the mothering makes for healthier babies and a lot less work on our part. The geese are staying. We’ve harvested some this fall, I made amazing rillettes and that decided that. We gave away some of the babies, and are working our way down from a high of fifteen to a trio of females and two ganders. One gander would be better, but we are keeping a back-up unit that turned out to be a pretty attentive father last spring. Once the apple trees are bigger, they are going to be highly effective orchard mowers–they kept the rest of homestead well mowed all summer. The ducks are still on probation. I want to see how far they will forage come spring, and whether we get any babies. I love hearing them murmur and quack at dusk, they just sound so happy. And we are awash in eggs in winter for the first time ever. But we aren’t going into duck egg farming in a major way until I figure out how to sell them. The only ones we add for 2016 are the ones they raise themselves. Blue red bronze male turkey: this one stays as patriarch for future flocks. Turkeys for the win. We haven’t yet put any birds yet onto the new orchard down the street, in part because we don’t have it fenced tight enough and in part because it adds yet more complexity. But the grasshopper situation this year was getting dire. There’s a lot of work for foragers to do. After kicking it around for weeks, the turkeys won out. Once we get a good watering system in place, they should be easier to care for off-site than layer hens. We won’t fight them about the coop, clip their wings regularly, and accept that there might be raccoon losses. I ordered 15 more for delivery in May or June. And we are keeping one tom and two hens from this year that we hope will see enough in each other to make babies in the spring. Right now, in the cold, short days of winter, it seems like a sound plan. Just kill me if I mention peacocks. As far a duck egg sales go, try the Asian markets. My husband had an Asian coworker who bought every duck egg we could produce. 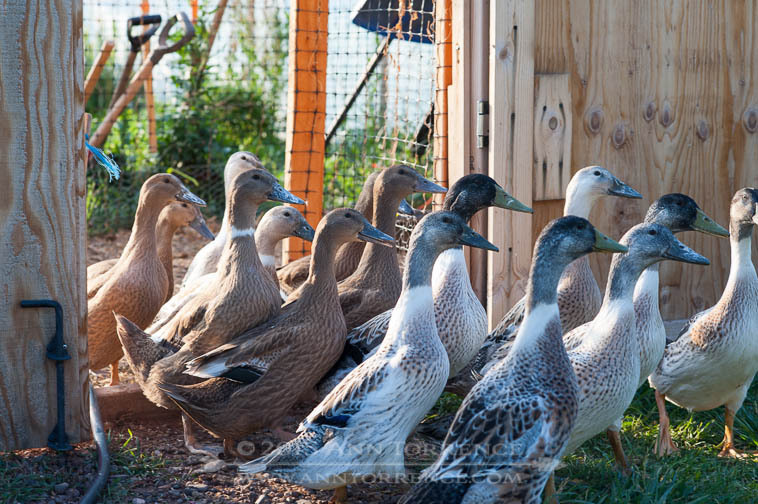 In fact, I had an order in for 60 hybrid laying ducks with Metzger Farms earlier this year when my mother got sick. They generously cancelled my order so we didn’t go through with it this year. Maybe we will try for 2016. Peacocks are for hearing strange screams in the tops of the trees. I would recommend them if you really want to annoy the neighbors.